Direct descendant of King John I of England (1167 AD). Great, great, great (x 23) granddaughter of Eleanor of Aquitaine, Queen of France and England. Generational Line of the House of Plantagenet. Named after Cornelius DeWees’s daughter, Ann De Wees, who founded De Wees Island off the coast of Charleston. Great, great, great (x 21) granddaughter of the Sovereign Prince of Wales (1232 AD), Llewellyn Gryffyth. Reigned as King of England from April 6, 1199 until his death. Youngest son of Henry II an Eleanor of Aquitane. Succeeded to the throne as the younger brother of King Richard I (Richard the Lionhearted). English Royal House of Plantagenet. Pope Innocent III and King John I had a disagreement about who would become Archbishop of Canterbury which lasted from 1205 until 1213. King John’s mother was Eleanor of Aquitaine (1122-1204), the Queen of both France and England. Queen of France and England. Mother of King John of England. One of the wealthiest and most powerful women in Europe during the High Middle Ages. Queen consort of both France and England in turn. She is well known for her involvement in the Second Crusade. Llewelyn ap Griffith. Llywelyn or Llewelyn ap Gruffydd (hl?wel'in äp grif'ith, luel'in) , d. 1282, Welsh prince, grandson of Llywelyn ap Iorwerth. The present Prince of Wales is 21st in the line, counting several who were never formally invested. He can trace his descent back through the Tudors to the original Princes of Wales, of whom the last native Prince of Wales was Llywelyn ap Gruffydd (1246-82). The specific lineage of Dr. Ann de Wees Allen’s family spans 13th generations of De Wees’ (from 1563) with family roots dating to 1200 AD, 740 generational De Wees’, and 25 generations of Royal Plantagenets from 1122 AD. 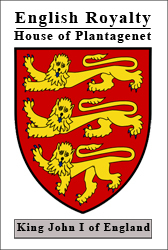 Not all of the De Wees family is related to the Royal family, as only one generational line of the de Wees family can be traced through legal records (UK Royal Families/De Wees Lineage) to the Royal Plantagenet line (1122 AD)*. The De Wees family (in the Ann de Wees Allen line) settled in England at the beginning of the reign of Henry VIII. The De Wees Royal Coat of Arms; the Earl of Warwick Coat of Arms (1269 AD), Esse Quam Videri, and the Prince of Wales cup and Seal are in the possession of descendent Ann de Wees Allen (Washington, D.C.). * Note that it is illegal to claim generational lineage to the Royal family if has not been fully documented. Not all of the De Wees lineage is related to the Royal family. The lineage of Ann de Wees Allen has been fully documented by legal authority. Attempts to copy or utilize the data found on this website related to Royal lineage require written authorization from the authors at this site. Copyrights and trademarks to specific information on this website apply and are subject to Federal lawsuits for infringement. Ann de Wees Allen’s family founded De Wees Island in Charleston, South Carolina. Cornelius de Wees and his daughter Ann de Wees (whom Dr. Allen is named after) lived on De Wees island in their plantation home until Cornelius’ death in 1786. Charleston, S.C. was founded in 1670 (then called Charles Town) named in honor of King Charles II of England. After Charles II (1660-85) was restored to the British throne after Oliver Cromwell’s Protectorate, he granted the chartered Carolina territory to eight of his loyal friends, known as the Lords Proprietor, in 1663. By 1680, the settlement of Charleston had grown, joined by others from England. Charleston was the center for further expansion and the southernmost point of English settlement during the late 1600s. Charleston represented civilization to the colonials. In June of 1776, Charleston found itself embroiled in the Southern Campaign of the Revolutionary War and handily defeated the attacking British fleet. De Wees is now a private island with uncrowded wild beaches, dedicated to the preservation of its unique coastal ecology. It is a haven for wild birds and endangered species, and has won numerous environmental and ecological awards. A history of Cornelius and De Wees Island may be seen at www.deweesisland.com (click on Mission, see History of De Wees Island). Since the Revolutionary War, Dr. Allen’s family has been very active in the DAR (Daughters of the American Revolution). Dr. Allen says that Cornelius de Wees’ determination runs in her family and points out that she and her namesake, Ann de Wees Allen (born in 1777), share the same birthday. Allendale, SC, is named after Paul H. Allen, born January 1813, who founded Allendale and was the first postmaster of the settlement subsequently called Allendale, SC in 1849 (then part of Barnwell County). (History of SC by Yates Snowden, Vol 5, p243; A Guide to the Palmetto State, SC Writers Project, p 453). Paul Allen died March 1909 and is buried in the Swallow Savannah Cemetery, Allendale, SC. The family home, called “The Grove” was built in Allendale before the Civil War. The estate survived the Civil War and was left to its heirs Ann de Wees Allen of Washington, D.C. and William Humphries of New Orleans, who married the Queen of the Mardi Gras, Mignon Faget. Ann de Wees Allen was a Flower Girl in the marriage ceremony of Mignon Faget and William Humphries. The Allendale home contained pre-Civil War furniture, the 1st piano in the South, antiques, and family papers, including Civil war documents, and handwritten letters from author O. Henry, who married into the Allen family.